Okay, so now that you know a little about Chios, let me tell you about some of the things that one definitely should (not) miss. Chios, for the most part, has paved roads, although some of them questionable of size and functionality. If you find yourself in a little back alley, not fit for one vehicle, imagine yourself being face to face with oncoming traffic, but fear not, playing chicken will soon become your second nature as you find little nooks to let other cars pass. Now on top of that most “streets” have no street names, if you google some of the places that we visited in Chios you will literally find “no name dirt-road” as a description. BUT fear not (well, if you haven’t feared up til now already). To get around, we relied heavily on google maps, which was both a blessing and a curse. In most cases, google did actually pretty well guiding us to where we wanted to go, especially if you downloaded an offline map beforehand and had your route mapped out. But in some cases, google just refused to accept that we were human… But let me back up here for a second. 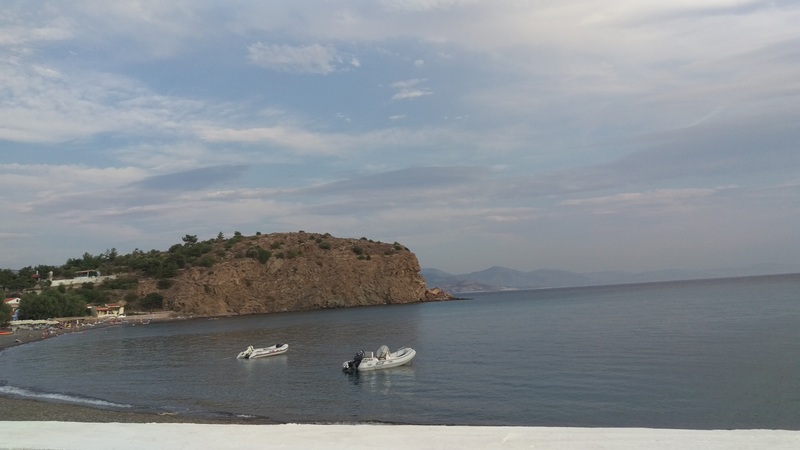 So, on day two of our Greece trip, we – of course – wanted to go to a beach. In Chios there are two types of beaches, “organized” beaches and “unorganized” beaches. An organized beach is a beach, where you find several beach cafes (with working toilets) which offer hot meals and cold drinks, beach umbrellas and for the most part free wifi when you order something from them (frappes, always go with frappes!!!). Usually, these beaches are easily accessible, children friendly, offer parking and lots and lots of people and music. They also offer showers, and if used, you could smartly avoid salt stains in your rental, when you decide for a quick dip before heading to dinner. Apologize the quality of the photo, I took it while we were driving, but to the left of the photo you’ll find an organized beach. Also, for the most part we went to unorganized beaches, so that’s the best I could dig up. The counter part to organized beaches are unorganized beaches, where you basically have none of the above but pristine beaches, and really clean, imagine that! More often than not, you barely have anything that one remotely could call road access the beach, so you need to be gutsy if you attempt one of the unorganized beaches! That was, until the car all of a sudden could not handle where we were anymore and the energy within and on the outside of the car changed. Now remember, it’s the middle of summer in Greece, it’s beyond hot outside and we are far from anything called an acceptable cell-service, and even if we were, I wouldn’t even know who to call and how to describe where exactly we were, other than in the middle of nowhere, surrounded by mastic, figs, olive and lemon trees which basically is 70% of the island. The car, at this point had died several times already, and we reached worst-case-scenario-level. We had to acknowledge, that the vehicle was simply not going to make it, and that’s when A decided – smartly, if you ask me – to turn around and try to find another way to an organized beach (so we’re not even talking a beach, where you expect horrible roads!). But as A tried to maneuver the car, the sand and pebbles around the back tires had somehow turned to a thick paste and the car simply did not like it. So we looked at each other, in silence, in defiance and greatly judging google for this road from hell, wondering what we should do. I already made my peace with having to abandon the car and walking back to the hotel. If you wonder why we didn’t just think about pushing the car out of the ditch: it was about 35 degrees C (*really hot in American*) and that heat on metal meant third degree burns (again, worst-case-scenario). As I was slowly speaking out, trying to keep my cool but secretly (or not so secretly) having lost it already, A decided to give it one last try and miraculously made it out of the ditch from where on he did not let go of the gas. At this point, and since we haven’t seen another car for about an hour, A just pressed on with a boot of lead, making sure that we got out of the situation as soon as possible and because no one is as dumb as foreigners trusting google blindly into sandy pebble roads, no one witnessed our little detour. And if they did, I am sure they had a good chuckle from our situation. Personally, it took me about 3 days to feel comfortable in the car again, and that’s not for the lack of A’s driving skills. I know for a fact (and – sadly – from experience), that if I would have been driving, more likely than not, I would have totaled the car in less than 24 hours, just trying to make a turn or parking the car. Needless to say, that this was the last and only time that we trusted google maps and it’s crazy suggestions. I’d love to say that this was the only time we found ourselves in a sticky driving situation, but that would be a lie, at least the other times it was a conscious decision to just go for it, rather than trusting google, if that makes any sense. I wish I could show you a photo of one of the sticky driving situations we found ourselves in, but truth to be told, for the most part I was terrified of being in the car while being in these situations. 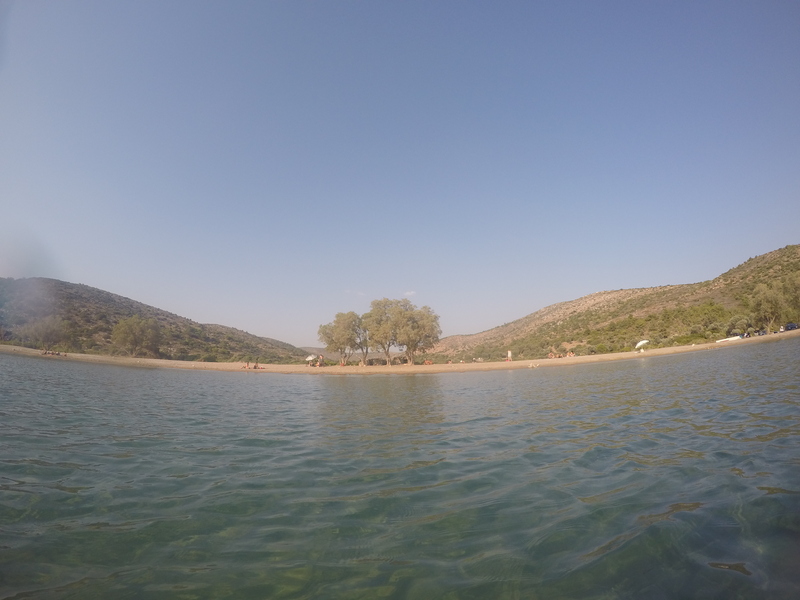 But, to all the crazy driving roads of Chios, there is always a reward: So here is a photo of an unorganized beach that we lovingly called starfish beach because we found a starfish in hip-deep water. Also, the umbrellas are personal umbrellas from smart beach-goers.